Alice Englert, 25-year-old lead of “Them That Follow.” (Photo by Connie Wilson). The film benefited mightily from superb casting, scoring Olivia Colman, fresh off her Oscar win for “The Favourite,” and the always charismatic Walton Goggins, previously known for playing Boyd Crowder in 74 episodes of “Justified” between 2010 and 2015. “Them That Follow” has just been selected by the Chicago Critics Film Festival as one of the first seven films to be shown at its film festival slated for May 17-23 at the historic Music Box Theater. 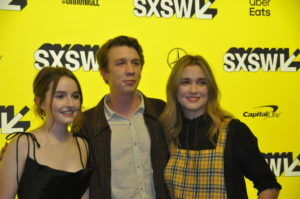 (L to R) Kaitlyn Dever, Thomas Mann and Alice Englert, who are Dilly, Augie and Mara in “Them That Follow” at SXSW. (Photo by Connie Wilson). Walton Goggins’ preacher, Lemuel, is “in” to snake handling and his young daughter is an ardent follower of his church. However, she has fallen in love with Augie (Thomas Mann), son of Olivia Colman’s storekeeper and ardent church-going woman of the Pentecostal faith. Olivia’s husband is played by Jim Gaffigan as Zeke. It is certainly true that comedian Gaffigan must be one of the most ubiquitous actors working, as he also turned up in “The Day Shall Come” at this year’s festival and at “You Can’t Choose Your Family” at last year’s SXSW. I have to admit that I hadn’t really ever thought of Olivia Colman and Jim Gaffigan as man and wife, but they give it their all. 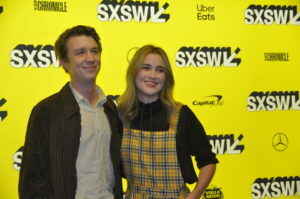 Thomas Mann (Augie) and Alice Englert (Mara) are the young lovers of “Them That Follow” at SXSW. (Photo by Connie Wilson). Mara’s proposed marrying off to Garret (Lewis Pullman), despite her unprofessed love for the unbeliever Augie, is what sets the plot in motion. 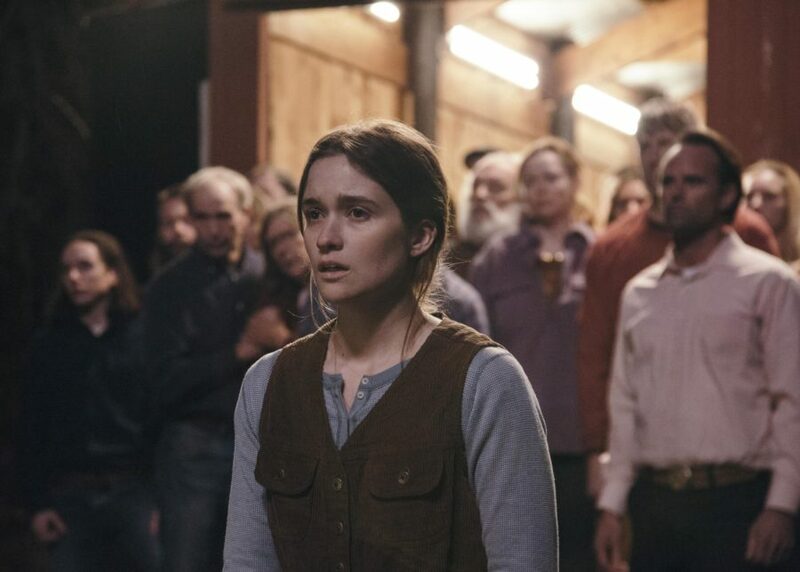 As you can imagine, there are many scenes of snake handling and tests of faith when Lemuel (Walton Goggins) learns that Mara is pregnant and, relying on the Bible (“Woman—Eve—is the first sinner and she must be cleansed!”) subjects Mara to a test of faith and a cleansing by way of the poisonous rattlesnakes the Congregation uses in its worship services. The cast did share that the rattlers are not REAL rattlesnakes (“Those snakes were friendly. Stumpy was a delight.”) but relatively harmless snakes who have, over the years, changed their appearance to mimic the dangerous rattlers for protective camouflage purposes. The cast also worked with a dialect coach, Judy Dickinson. See it. It’s good, and well worth the investment of time and money.